NTI offers a wide range of products both for network and analog solutions. Extend control up to 1,000 feet away via CAT5 with no loss of signal. Switch many computers' outputs to many displays (projectors, monitors and more). Control multiple computers with one keyboard, monitor and mouse. Keyboard, mouse, and LCD monitor in a 1RU rack drawer. 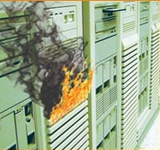 Monitor server room threats: high temperature, low humidity, intrusion, water leakage, etc. Control one computer with multiple keyboards, monitors and mice. Share one monitor among multiple computers. High quality rack mount LCD monitor and rackmount keyboard products. NTI has the cables, extenders and adapters you need to extend your keyboard. The Mini Server Environment Monitoring System monitors critical environmental conditions (such as temperature, humidity, and water leakage) that could destroy network components in your server room.